This quote is one of my favorites. How true that is! As part of making our house into our castle, I've been trying to enjoy the "little" things more. Just writing this series has been very reflective for me and opened my eyes to how many things I have to cherish. And none of those things are material things. These precious moments we have with our families are really the important things. It's funny all these seemingly "little" things are what makes my life so enjoyable and happy. And it is what helps make my house feel like our little castle. 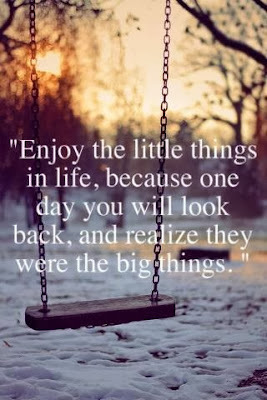 I hope everyone is having a great weekend and enjoying those "little" things you have going on in your life!